Amid the sniffles, coughing and fever, "it's sometimes difficult to determine whether you have the common cold or the flu," said Dr. Boris Khodorkovsky. He's associate chair of emergency medicine at Staten Island University Hospital in New York City. But it's an important question, he said, because while colds and flu share some symptoms, flu can become severe enough to land you in the hospital. Certain symptoms -- runny nose, congestion, sneezing, minor body aches and fever -- are common to both maladies. But "your alarm should go off when you start experiencing high fever and chills" -- that's most probably the flu, Khodorkovsky said. He said "high fever" is typically thought of in this context as 101 degrees or above, but lower fevers can sometimes occur in otherwise severe flu. Dr. Len Horovitz, an emergency physician at New York City's Lenox Hill Hospital, agreed. He added that one thing to watch for is how quickly the illness escalates. "The common cold can come on slowly -- sore throat, sneezing, cough, fever -- while the flu is rapid in onset," Horovitz said. "The onset of flu is also often "accompanied by severe body aches, weakness and sometimes skin sensitivity," he added. If it is influenza, the standard advice applies, Khodorkovsky said. "It's important to take fever-reducing medications, stay at home and away from other family members as best possible, rest, and most importantly -- hydrate." Hydration can be with plain water or with broth, which helps nourish the body, too. That old standby, chicken soup, can work wonders. "There's research that suggests chicken soup can inhibit mucus production that will help alleviate a runny nose and cough," Khodorkovsky said. "Sports drinks, preferably diluted with some water, will also replenish vital electrolytes and sugars," he added. And medicines may help shorten the ordeal, Horovitz said. "The flu can be treated with Tamiflu if started within 48 hours of presentation," he said, while zinc supplements may help ease the common cold. Of course, not every case of flu ebbs away on its own at home, and this U.S. flu season is already seeing a big spike in hospitalizations. "If your symptoms persist and escalate, seek medical attention immediately," Khodorkovsky said. 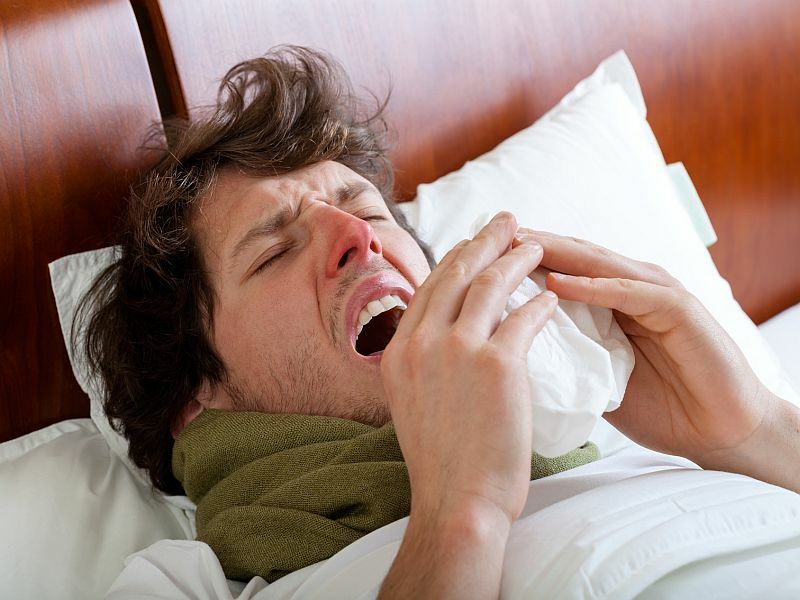 "Influenza can lead to respiratory complications like pneumonia, to even something more fatal." Your best defense against colds and flu? Not getting one in the first place. Hand washing is key, Khodorkovsky said. "Flu travels via droplets in the air, but also can live on surfaces for up to 24 hours," he pointed out. "Think of all of the door knobs and handles you grab and hands you shake each day. I recommend washing your hands every one to two hours during this season. And Horovitz added that this means only touching your face, mouth or other people if you know you've just washed your hands. "Additionally, it's never too late in the season to get the flu shot," Khodorkovsky said. "It's not a 100 percent guarantee, but [it] will protect you from the deadlier strains of the virus." There's more on seasonal flu at the U.S. Centers for Disease Control and Prevention.